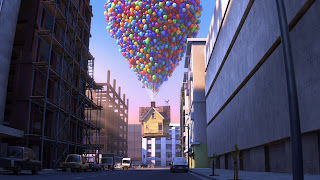 Okay, so Pixar has once again proven that it is the best in the computer animation factory of feature films (alliteration is still my favorite figure of speech). Pixar never compromises the story. If the story sucked in the first place, it wouldn't get the green light for production. Pixar cares not about celebrity voices. Except of course for the Toy Story series, but I can defend that. It just so happens that Tom Hanks's whiny voice is perfect for Woody, and Tim Allen is perfect for Buzz Lightyear. Simple as that. Here in Up, Christopher Plummer and Delroy Lindo are the biggest names in the voice list. Delroy Lindo is okay, since he's not too mainstream anyway, but I don't know about Christopher Plummer, who seems to be making a comeback, what with The Imaginarium of Dr. Parnassus coming up this year. I think he's jealous that the-other-Dracula-also-named-Christopher Lee is still raking up film credits. Pixar cares not for pop music in their soundtracks. Better to have classical music than Britney Spears. Pixar directors are good. Hooray for Pete Docter and Bob Peterson. So that's it. Basically, Pixar does not believe in selling out. Except again for Toy Story, which I just realized used more than two famous actors for voice talents. Well, we can justify it as being Pixar's first feature release, which entitles them to all the mistakes they want to make. But this is supposed to be a review of Up, not Toy Story. And yet I mentioned Toy Story more. What is wrong with me? Describe Up in two words: Eye. Candy. The colors, the shapes, and the cuteness of the boy Russell and the talking dog which I'll bet is a Labrador. Russell is so cute that I want to have a kid like him and hope he gets forever stuck at that age, so he will remain that cute forever. But of course, that is impossible. But so is a flying house. But still, the most beautiful part of the movie was from the very beginning, right up to the part where the old man's wife died. Nothing makes me say "Awww..." more than a montage of childhood sweethearts all the way to old age. P.S. I really love films with Star Wars references. The Force is strong in Up's animation department. Russell's cuteness: Nine out of ten. I loved the first part. I almost cried when his wife died. another review that makes me wanna see the movie and this quote "it just so happens..." = WIN! @gabcanfly: Yes please watch it in theaters. Pixar films are always good in theaters. @The Captain: Again, I am truly glad when you think my lines are worth quoting. Haha! at paborito ko ang toy story, lalo na ang toy story 2. Napanood ko na! Madami akong iniyakang parts. Hahaha! ^'Di ba? First part is win. Hooray for childhood sweethearts! I loved the montage at the beginning, definitely might have been one of Pixar's most beautiful moments in a film. ^I know right. Childhood sweethearts who get married = win. naiyak ako dun sa first part ^^ sayang lang at sablay yung 3d glasses dun sa sinehan sa megamall. sumakit ang mata ko ~.~ pero sulit naman hehe. ^Waaah. I wanted to watch this in 3D. Meron pala sa Megamall. Boo.